You've heard the story hundreds of times before: Individual gives up their successful, well paid career in the hopes of following a dream. Over the years I've known a handful of people who have gambled away their lives in a bid to chase a midlife crisis dream to become a movie director; musician; a games developer and a stock market trader. None of these panned out very well and the end result was that each individual learned a very hard lesson: that the business world is a fickle place where luck plays more of a hand than any talent. And in the case of the director, he discovered that he actually wasn't very good at making films in the first place... and now he's lost his house and owes a small fortune to the bank, family and friends. Personally I always think it makes more sense to keep your dreams as hobbies - that way you can still enjoy them and have complete creative control and set your own deadlines, safe in the knowledge that your "proper job" is keeping you afloat financially. The Tomicks is a completely different story. Tom Cridland and Nick Whitehead are both incredibly talented... they deserve to achieve worldwide success, but they're rolling the dice hoping they can get the publicity and the fan base to carry them forward. I've lost count of the number of album's I've reviewed over the years where the artists, who have record contracts and are making a good living out of it, actually have no real talent on display. 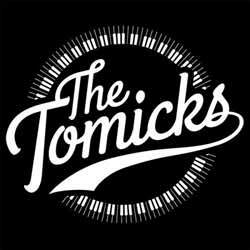 The Tomicks's self-titled debut album contains 10 tracks (41 min, 51 sec) and it's the diversity that hooked me. There's a good balance of tracks here, mainly concentrated in the Rock n' Roll genre. Kenji Suzuki, the lead guitarist for Simply Red, was so impressed with the demos that he played bass and guitar on the album. They have raw talent, and the production on this album is impressive, the breaking point will be getting the coverage. If you're a fan of Rock n' Roll I strongly advise you to give this a listen.